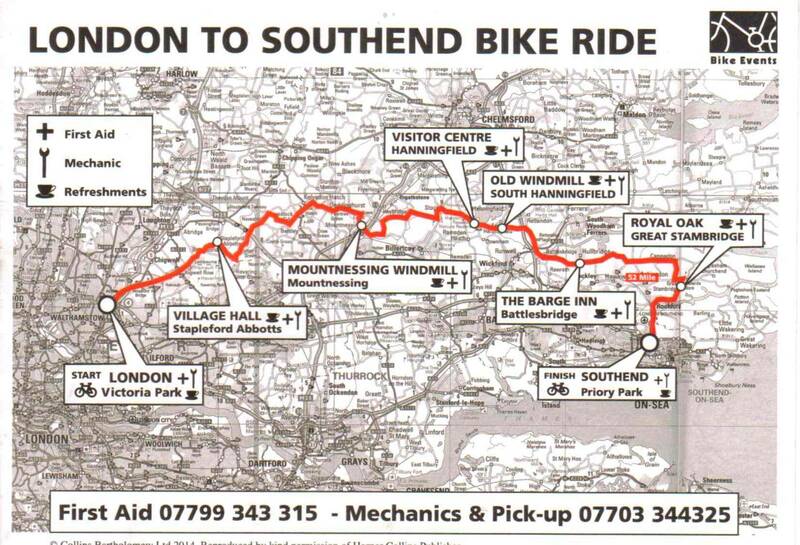 Well Sunday the 19th July came and we were all prepared for the London to Brighton Bike ride. All the hard work, sweat and training were to be put to the test. We left Bexley at 6.05 am and drove to our rendezvous, Amanda’s lot had left home at 5.15 am. We all met up and got our bike ready in the drizzling rain. Dean then discovers he has left his waterproof at home on the bed! Not sure what he was doing wearing it in bed!! We cycled just over a mile across Victoria Park to the start where Dean was lucky enough to buy a new packamacs for the bargain price of £25. We all sorted ourselves out and were ready to go on time. We were the second wave to leave at 7.05am and set off with the drizzling rain looking as if it is going to follow us all the way there. We had a good cycle out through the suburbs of East London and I had big Dave reliving his younger days as he was brought up in the area. He also pointed out some of the more interesting land marks, particularly Pubs. About half an hour into the ride and the rain left off and shortly after that we briefly stopped to take off the packamacs. 13 miles out and we had a very brief stop at Stapleford Abbotts for some of the team to have a comfort break, then swiftly we cycled on. The next scheduled stop at Mountnessing Windmill is where we had planned to stop for a short break at the 24 mile stage just under half way. Well the boys all arrived there and were waiting for Amanda and Nikki to catch up. Whilst waiting we partook of Liz's secret Flapjack, slow release carbs which helped us on our way. Well we waited and waited and then Dean informs us that they have taken a wrong turn and are about 7 miles off track. So they had 7 miles to come back and then too continue on the ride. After much discussion it was agreed the boys would press on and the ladies would follow on at their own pace. Little did we know the ladies would have time to play on the swings, (check out the pictures). On we cycled and as we passed South Hanninggield old windmill, (31 miles) a stop that we did not take, the sun came out and it started to warm up considerably. The rest of the ride was all lovely sunshine. The boys stopped at The Barge Inn Battlesbridge (37 miles) when we had a short break, bit more of Liz's flapjack and recharged of our water. We were all surprised by the number of hills that we had encountered on the route. From here on it was non stop to the finish line. 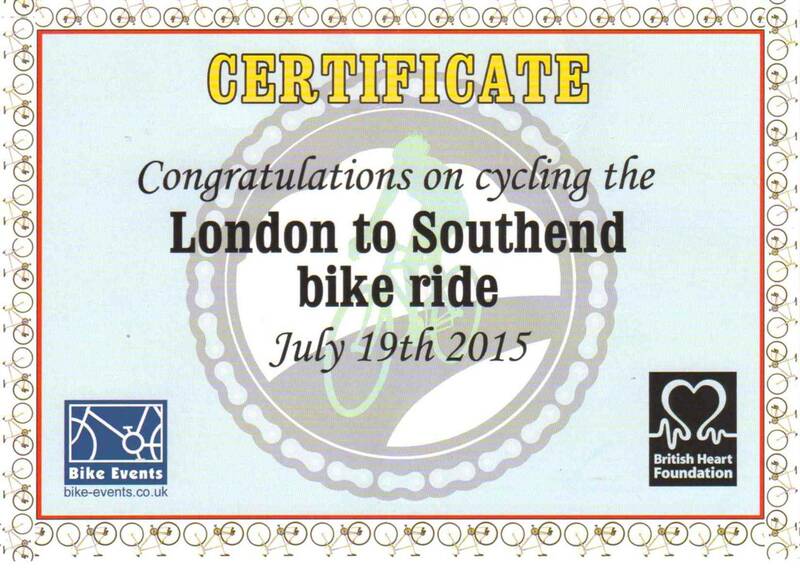 As we came into Southend we passed Southend airport and then another hill before the finish. The boys all rode into Priory Park together over the finish line. Tired but very pleased to have completed the ride. We met with Liz, and Guy’s daughter in law Karen and the two Grandsons Oliver and Jacob who were all there to cheer us as we finished. It wasn’t that long before we all returned to the finish line to cheer in the Ladies as they finished their epic journey.